Quietly, and without any fanfare at all, the Assen local government website now says that the last survey showed that at least 41 percent of all journeys in the city are by bike. This represents a significant rise on three years ago when there were about 37 percent of all journeys by bike. Note that this does mean all journeys, not just commuters. It's very much easier to get confident young adult commuters to cycle than to convince pensioners to cycle, or convince parents that it is safe for their children to cycle, or to convince people to do their shopping by bike. Also note that many journeys are made by foot or on public transport, and that when bikes are used to make journeys to the railway station (where there are 2300 bicycle parking spaces) or bus stops these journeys don't even get counted as cycle journeys. Somewhat fewer than half of all journeys are by car. It's easy to see why cycling has continued to be more attractive as the population of the city continues to rise at about 1.5% per year. It simply gets better here for cyclists all the time. The pace of cycle path building in and around the city continues to be brisk. Everything that was started last year has been completed. New things are now being done. We've new routes to the East and North East as well as to the West. Many paths inside the city have been upgraded, and we're looking forward in particular to being able to ride on a new recreational route nearing completion near our home. There are many other posts about Assen, which show other aspects of what it is like to live here. 2010 update: The link to the local government article no longer works. When this was pointed out to me, I wrote an updated article. The photos show some of the cycle parking on a typical day in the city centre. I have absolutely no idea how many official spaces there are for bikes, but it can of course never be quite enough. Assen doesn't have the highest cycling rate in the world. That honour goes to Groningen, a few km North of here. However, it is one of the many towns in the Netherlands which has a higher cycling rate than anywhere in any other country. 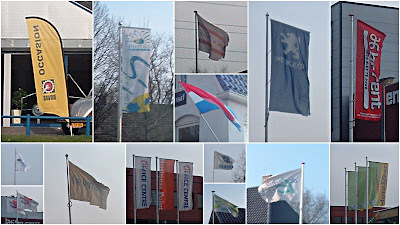 Quite apart from their patriotic usage (the flag in the centre of the image is the Dutch national flag, while the one at the top is the flag of Drenthe), flags are very popular in this country for advertising. It's easy to see why. These photos of flags were taken on my commute last Thursday. Every one of them was flapping briskly in the wind, and unfortunately every single one was pointing in the wrong direction for both my journey to and back from work. It's a myth that cycling is easy in the Netherlands because it is a flat country. A flat country is also a very windy country, and Wind is far more of a problem for cyclists than a few hills. You can go down the other side of hills, but wind stays with you. It may not be immediately apparent, but it isn't just when the wind is right against you that it is a problem. It still slows you down when it is a side wind, 90 degrees to your direction, and only starts to help you when it significantly behind you. Even then, a tailwind provides less assistance than the same strength headwind hinders you (if this seems strange, try the mathematical analysis here). This is perhaps why the Netherlands is a big market for the most aerodynamic type of cycles, and why people fit tri-bars even to the most unlikely types of bikes. As for me ? Well, the wind last week nearly made me late for work on Thursday. It took an hour and five minutes to cover the 31 km to get there, and virtually the same time to get back again afterwards. On Tuesday I had a very similar headwind on the way to work, but the wind had dropped off by the time I got home and the return journey took under 55 minutes. There have been a few posts on other people's blogs lately which have touched on the issue of litter, fly-tipping etc. on the environment for cyclists. It may seem like a minor issue, but as the BBC pointed out recently, the presence of litter on the streets is one of those things that makes people feel unsafe. If people feel unsafe on the streets then they won't cycle. This is what is meant by social safety. For cycling to be popular the environment has to be non-threatening. This means well maintained streets, well maintained cycle paths, a low crime rate etc. This in addition to making cycling routes direct and making cycling feel like a safe thing to do (subjective safety). I previously covered the aspect of litter by showing how cyclists here are provided with special litter bins for use while cycling. Update: "Son of Shaft" posted a comment below with a link to a particularly interesting article in New Scientist about related research. Click here to go directly to the article. Judy and I went for a another great ride through the countryside yesterday afternoon and having heard this wonderful Irving Berlin song sung by Ada Jones (recorded back in 1909), I made a bit of video to go along with it. As I have mentioned many times before, it's always a pleasure to cycle here precisely because you get to "keep away from the fellow who owns an automobile" virtually all the time, as you do on all of our holiday routes. We were actually on the way to see the men's Ronde van Drenthe pass through Westerbork, which I also made a video of, though you see much more in the local TV station's coverage. Most of the area is quite flat, but the race route includes a 23% hill. The winner was the Italian Maurizio Biondo who averaged 43.23 km/h over the 205 km course. Second place was taken by the local competitor Kenny Van Hummel. His team's car is often to be seen parked just a few hundred metres from our home. Our speeds were a little slower. Speed really wasn't the point. There are more holiday style posts and more touring and recreation posts. If you want to see these routes for yourself, book a cycling holiday. We're riding on a cycle path which is four metres ( 13 feet ) wide and separated from the road by a 3 m ( 10 feet ) green area. This set of traffic lights is for drivers who wish to use the motorway, which goes over the cycle path on a bridge just behind the camera. No need for cyclists to stop here. This second set does have a light for cyclists, but it defaults to green for bikes. Drivers who wait in the right turn lane here or who are leaving the industrial estate on the right can trigger a green light for themselves and for the cycle light to turn red. Otherwise it will be green for bikes. I featured this before, with a video. Cyclists can also make a left turn here. Now the third set. This again doesn't interfere with cyclists at all. No need to slow down or stop here on a bike. Neither cyclists nor drivers can make a left turn here, but drivers may have to stop to let other motor vehicles coming from the left merge. The scooter like vehicle on the cycle path is a three wheeled electric buggy which transports the rider in her wheelchair. People with all sorts of disabilities make much use of cycling infrastructure in the Netherlands. Next to that person on the right of the cycle path is a cycle only access to the industrial estate. The speed limit on this busy road is 50 km/h (30 mph). Cyclists are not expected to share the road with cars even at these relatively low speeds. I've read a lot of comments, especially from American cyclists, about how they believe that higher petrol (aka gas or benzine) prices will lead to more cycling. Comments are made that "in Europe" the cost of driving is much higher and as a result more people cycle and fewer drive. It's not as simple as that. For a start, not all of "Europe" is the same in every way. The Netherlands and the UK differ markedly in the cycling rate. While the Netherlands has the highest cycling rate in the world with 27% of all journeys being by bike, the UK has amongst the lowest at around 1%. Much the same rate as the US, in fact (you can find figures for comparison here). However, a difference in the cost of petrol is not the issue here. The sign in the photo shows the price of petrol and diesel in the Netherlands today at a garage that I cycled past: 125.9 and 94.4 euro-cents per litre. An online petrol price website tells me that the average costs in the Cambridge (UK) area is 91.4 and 101 pence. These two figures work out as $6.08 and $4.79 per US gallon for petrol and $4.56 and $5.28 per gallon for diesel (a significant proportion of cars both here and in the UK run on diesel). Similar costs in both countries. Both much higher than the price of around $2 per gallon in the US. Other costs of running a car are also very similar in the UK vs. the Netherlands. Clearly something other than the price of this fuel is the reason for the differences between usage of bicycles in the UK and NL. Riding a bike for a while here in the Netherlands makes it very obvious what it is. Here you have more direct routes if you cycle and the whole experience feels an awful lot safer. For a high cycling rate, you need a lot more than just expensive gas. Comparing the Netherlands with the UK is quite interesting from the point of view of car ownership. 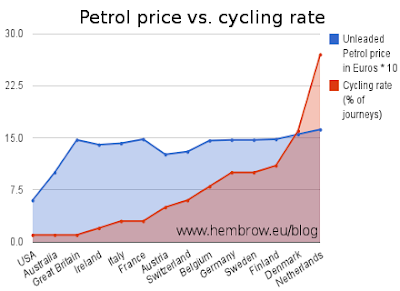 There's a graph of cycling rate vs. petrol price in a newer blog post on the same subject. The third price shown above is for LPG - Liquified Petroleum Gas, which is also sold as fuel for motor vehicles. Underneath the Northern part of the Netherlands is the Groningen Gas Field - the largest natural gas field in Europe.